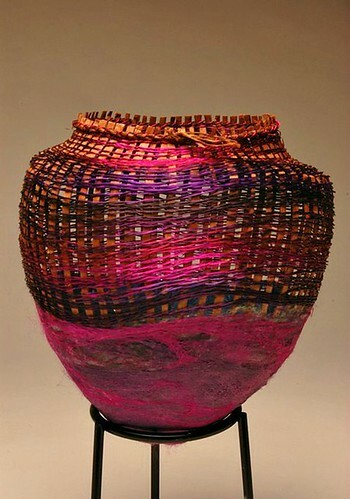 Donna Sakamoto Crispin of Eugene, Oregon is a basket weaver and fiber arts instructor. 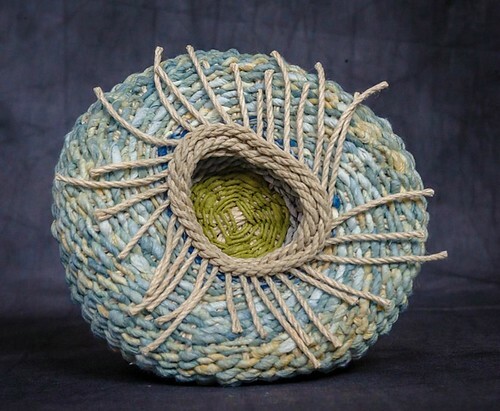 While her degrees are in sociology and education, she has taken many basketry, weaving, ceramics, and jewelry classes over the years, and teaches basketry workshops throughout the Pacific Northwest. Often Donna works with western red cedar, collecting it in area forests and creating her own strips using traditional Native American methods to weave objects that reflect the beauty of nature. As a third generation Japanese-American, she also has an interest in incorporating Japanese culture into her work. 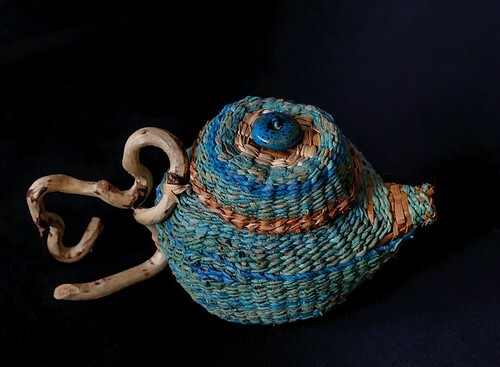 While bamboo is most typically used for basketry in Japan, without access to a ready supply, Donna began experimenting with washi paper, which is made from the inner bark of a mulberry tree. She cuts the washi paper into thin, continuous strips and spins it with a spinning wheel or bobbin winder. The spun paper can be woven on a small loom or used to form a basket. Interestingly, Donna told me she has also made a piece with Korean mulberry paper, known as hanji. If you're a longtime reader of this blog, you might recall posts about hanji and Aimee Lee. In fact, she recently attended one of Aimee's workshops - the paper world is small indeed! You can read about the workshop and see photos on Donna's blog. 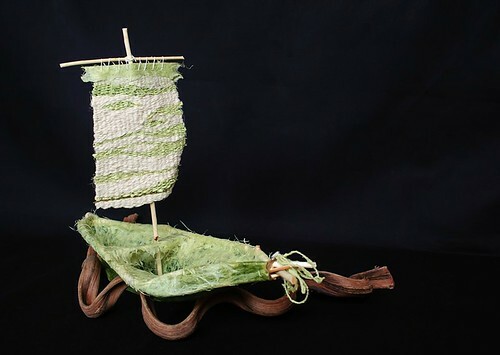 Just this past year Donna began researching traditional and modern ways to make shifu, Japanese paper yarn used for weaving projects, and koyori, which is handspun paper cord. She enjoys experimenting with many kinds of paper and has even spun old dress pattern paper! Enjoy this short video Donna made as an introduction to shifu and koyori. Love 'Spirit Boat'. Beautiful work! Thank you Maureen and Carole M.! how fantastic are these woven artworks!wow spinning washi tape! !i love the idea ...the colours in the weaving are lovely. I hardly recognize the washi paper....beautiful work! These are stunning. I love the rich colors! Beautiful work. I love the colours in the first basket.